More than three-quarters of employees would rather work on their own, according to a survey conducted by the University of Phoenix. Yet…group projects and team assignments are a reality of our lives as students and professionals alike, like it or not. Even though more than 75% would rather work on their own, 60% of those surveyed in that University of Phoenix study believe that collaboration and team-building are among the necessary skills for students graduating today. In case you needed further proof that that group efforts aren’t going anywhere, Forbes has identified five workplace trends. #2 on the list: new collaborative technologies that give the freedom and flexibility to work from anywhere and connect with colleagues, no matter where their time zone. #4 on the list: Millennials will soon be a majority of the workforce–and this generation prefers to work in teams and make group decisions. Declara recognizes that collaborative work and team efforts are an important facet of our users’ lives. We’ve just released our Groups feature, intended to make your life easier when you need to get something done and work with multiple people to make it happen. Groups works for study groups, book clubs, workout buddies reading up on the newest exercises, coworkers researching what’s happening in their fields–you name it. Meet Jessica. She is a sophomore who just moved back to campus. It’s only the second week of class, and she already has two group projects on the docket. 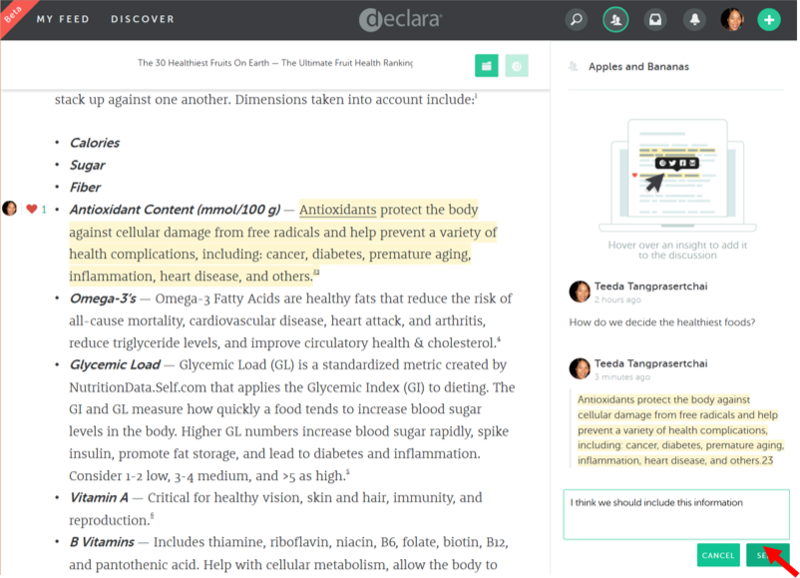 Fortunately for Jessica (and all of her fellow group members), she already uses Declara to organize what she reads for class and share articles with the student association committee. Jessica creates different groups for each of her class projects, then invites her team members, who will receive an email with a link back to their group work space. Once the group members have logged into Declara, they’ll be able to share articles, PDFs, and videos in the “Content” section. All group members will be able to see what’s being added, and each will be able to virtually highlight the important parts of their research, which other group members will be able to see. 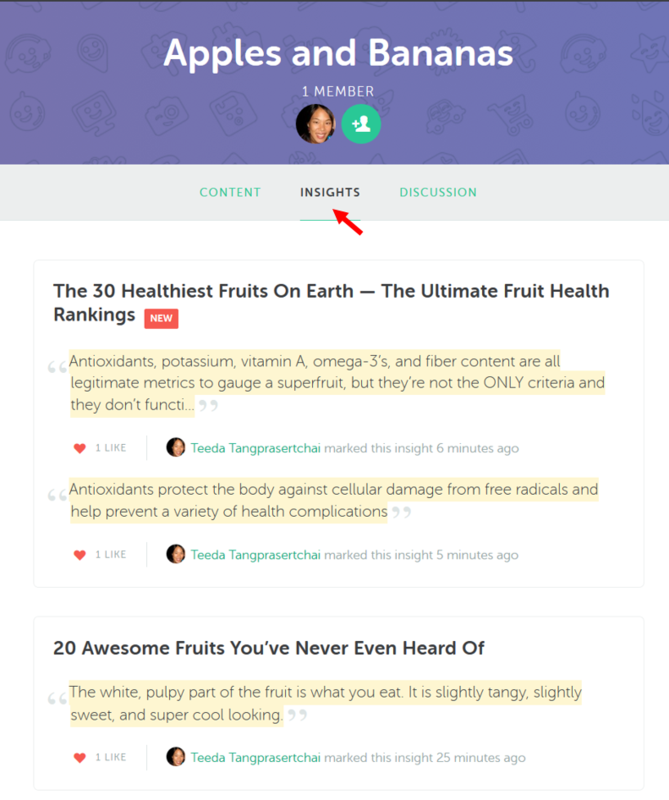 Jessica and her team can read articles in their entirety–or see the parts that have been highlighted by clicking on the insights tab in their group work space. Of course, no project would be complete without a hearty discussion, and Groups gives you a place where team members can review the research and insights and share their ideas. 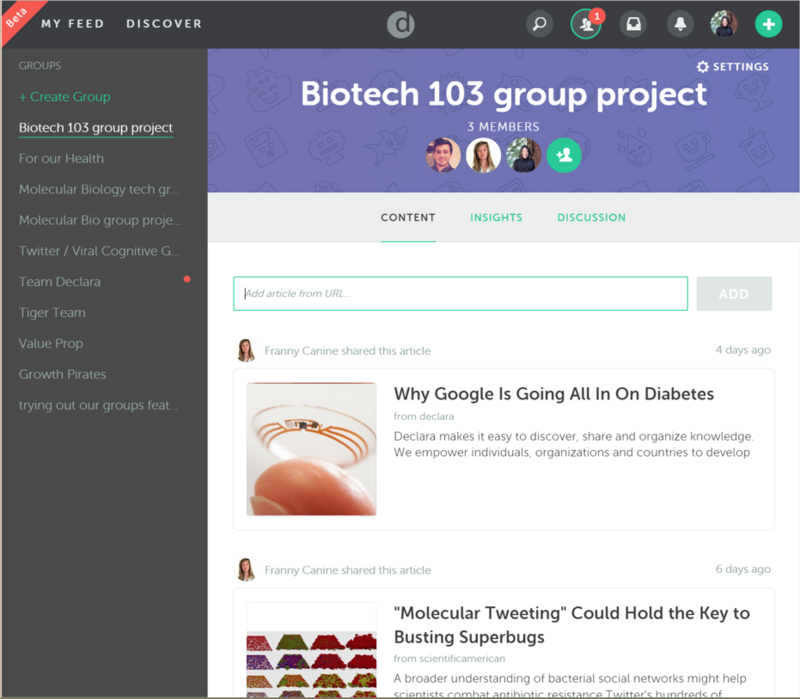 You can create your first group after you’ve joined Declara by clicking on the Groups icon at the top toolbar. Check out this article for more tips on getting started. We welcome your feedback! 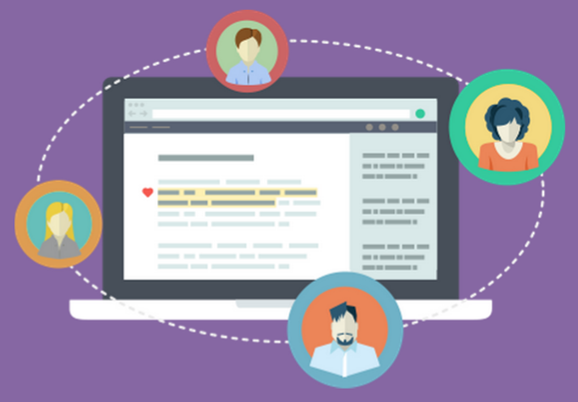 Please send any feedback to and email your feedback directly with our developers at help@declara.com.